Actually, it doesn’t really work – La Folie’s parody of an Italian aria in Platée is hardly a paradigm of madness, for instance – but it makes for an entertaining sequence. One result of treating these disparate numbers as an integrated whole is that some of the pieces practically trip over one another: an air from Les Indes galantes leads straight into the overture to Pygmalion, to be abruptly followed by an air from Les Paladins and a contredanse from Les fêtes de l’Hymen et de l’Amour. What comes across is the marvellous variety of Rameau’s invention, whether it be the maddeningly catchy ‘Air pour les Sauvages’ in Les Indes galantes or the achingly beautiful ‘Tristes apprêts’ from Castor et Pollux. 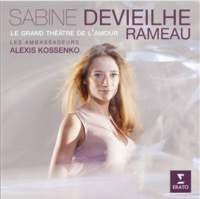 Sabine Devieilhe gets everything right, with excellent support from Les Ambassadeurs. Texts are provided, but the anonymous translators don’t know their tambourins from their tambourines.